Get regular physical activity, 30 minutes of aerobic activity most days of the week. It increases the flow of blood to the brain and can lower the likelihood of Alzheimer’s by 30 to 50 percent. Eat omega-3s. 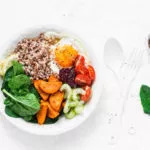 Oily fish (like wild Alaskan salmon, sardines and herring), walnuts, fortified eggs and freshly ground flaxseeds all provide omega-3 fatty acids, which are linked with reducing inflammation. Take supplements and vitamins. Vitamins E and C are good choices, and B vitamins can help lower blood levels of homocysteine, a toxic amino acid linked to an increased risk of Alzheimer’s. Stay mentally active. Read newspapers and books, dance, do crossword puzzles, play musical instruments, participate in ongoing education, learn a new language. Read Dr. Weil’s Condition Care Guide article on Alzheimer’s Disease. Want to learn more about keeping your memory strong? Dr. Weil on Healthy Aging is a premium subscription Web site that will provide you with simple and effective preventive health information and tools to help you age with grace. Start your free trial today and make every day a healthy one!